Last weekend offered a chance to get away from it all and travel upstate. From the balcony of my room, I could see a huge swath of stars across the sky. 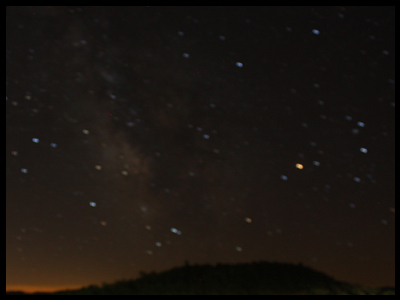 As the night grew darker, the Milky Way stretched across the mountains. I took this shaky image by holding the shutter and increasing the exposure length. If you look carefully, you can see the galaxy spread further out into the night. I was always a fan of science as a kid, but looking at the night sky would move me to a more philosophical frame of mind. I knew that stars were not just “fireflies” as Timón would say, but “big balls of gas burning billions of miles away” as Pumbaa suggested. While the scientific knowledge satisfied my logic brain, I began to think of deeper questions of existence. The questions that cross my mind these days are still philosophical, but have moved from inward consideration to the outward. Gen Y is thought to be extremely self-centered, but I believe that’s just a misperception of a classic introvert trait. Yes, as we move/d through our adolescent years, we spend/spent a good deal of time worrying about ourselves, our appearance, our standing, but so have the generations that preceded us. We develop and learn that there are things beyond our microcosm, and Millennials are still progressing on that path. I may not have known the words at the time, but I understood on a deeper level the need to connect with others. Teamwork is in my DNA, though solo projects can be just as pleasant. The quality that most unites people is empathy. I may not know each perspective of people I meet, but by listening to them, I can empathize and understand their views. Empathy leads to understanding and understanding leads to success for all people. Millennials won’t take information for granted and will try to form their own opinions. We work out our own thoughts whether it’s what to wear or those deep philosophical questions we consider when looking at the stars. Take time to quiet your mind and consider these thoughts, and perhaps your contribution will present itself. Is empathy our strongest tool/legacy? Share your thoughts.